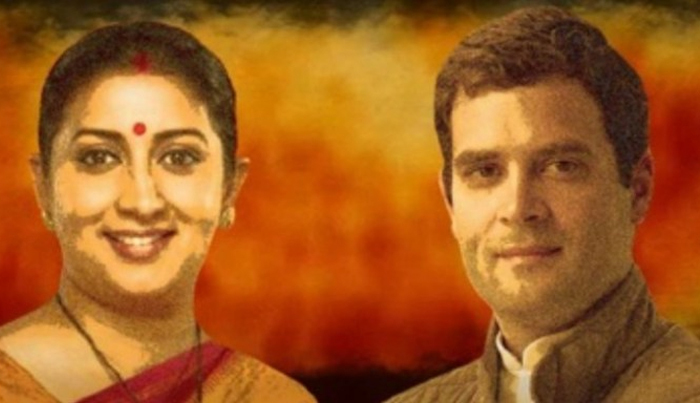 New Delhi: Several parliamentary constituencies are set to witness high-profile contest this election with the BJP announcing its first list of candidates and fielding Union minister Smriti Irani against Congress president Rahul Gandhi in Amethi. Irani had lost to Gandhi in the 2014 Lok Sabha polls but was seen to have put up a spirited fight. The Congress has earlier announced the candidature of Gandhi from Amethi in Uttar Pradesh. In 2014, Gandhi (4,08,651 votes) defeated Irani (3,00,748) by 1,07,903 votes. Besides this, the BJP's first list also set the stage for a high-octane battle in several constituencies such as Mumbai North Central, where BJP's youth wing President Poonam Mahjan will again take on Congress's candidate Priya Dutt. Mahajan, the daughter of late BJP leader Pramodh Mahajan had defeated Dutt, the daughter of former Union minister Sunil Dutt, in the 2014 general election. A similar battle is expected in the Muzaffarnagar Lok Sabha seat in Uttar Pradesh where the BJP has pitted former Union Minister Sanjeev Balyan against the SP-BSP-RLD alliance candidate Ajit Singh. Singh heads the RLD. Both, Balyan, the sitting MP, and Singh are Jats, which is a dominant caste in the western UP constituency. The BJP released its first list of the candidates for 184 Lok Sabha constituencies which includes Prime Minister Narendra Modi from Varanasi, party chief Amit Shah from Gandhinagar and Union Home Minister Rajnath Singh from Lucknow. The Lok Sabha elections 2019 will be conducted in seven phases starting from April 11 and will continue till May 19. The counting of votes will take place on May 23.